WPC railing although not cleaned regularly, but be cleaned regularly to prevent accumulation of dust or various stains after a long period, it is more difficult to clean. If the case of WPC baluster Once the stain and uncertain in what can be a good method of cleaning removals, it is recommended to clean wood railing with a small portion of the stained area as a test ground to prevent possible color difference is too large, If the results are good, then this method clears the other stained area. You can use the tap wash wood railings dust, dirt, mud on the line, do not wipe dry after washing, dry himself after a while, very convenient. 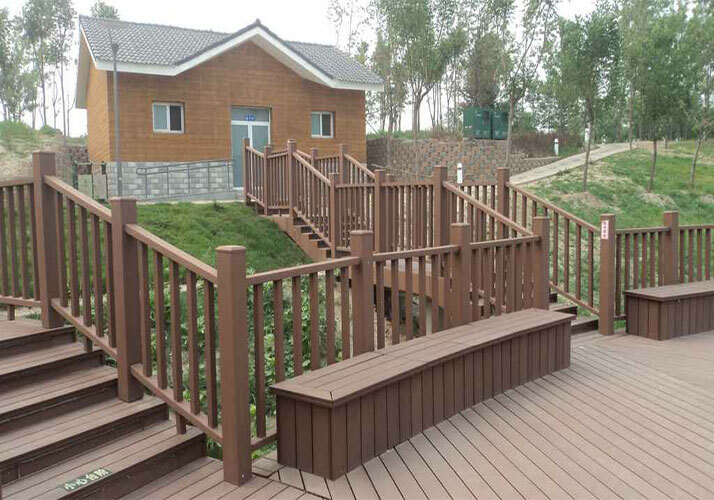 WPC railing, wood not only has the affinity, and the integration of nature, but also has wood nailing, drilling, planing, viscosity and other characteristics, the surface smooth and delicate, without sanding and painting, its good paint adhesion It can also be painted according to personal preference. At the same time, it abandoned the wood cracking, warping, there is color, fear of fire, fear of water, corrosive, easy to damp, moth and easy, easy to grow fungi susceptible to acid corrosion and other defects. Having are hard, lightweight, thermal insulation, smooth surface, free of formaldehyde and other harmful substances, non-toxic, pollution-free characteristics. Although easy maintenance wood railing, I must mention some considerations when installing WPC railing, wood railing installation inevitable when drilling in the drilling process for those relatively large density of wood, the use of self-tapping screws location required firstly drill hole lead, and then tapping screw fastening. So as not to affect the use of wood plastic.